It’s all change over the next few months here at Sheen Slings! Firstly we are adding a new location – Kingston! From May onwards the Children’s Centre are kindly giving me a monthly slot to come and run a Sling Library session. Exact dates and times to follow, but there will be 1 session a month going forward. And I couldn’t be more excited! This is something I have wanted to do for a long time,… I have so many clients coming from Kingston, Surbiton, Hampton, Esher and further and I know that this is an area in need of a Sling Library, and now with Rachel almost at nursery age and with a great venue on board it has finally been possible. Secondly, we are extending and refurbishing our home. Well our downstairs specificly. We’ve been planning this, thinking about it, slowly making it a reality since we bought this house 3 years ago. I am equal parts terrified and can not wait for it all to start come April. But it has impacts for Sheen Slings. For the last 3 years I’ve run the majority of my Sling Library sessions from my home – and this has been fab, its allowed me to continue running the Library while pregnant, then with a very young baby through to a crazy running everywhere toddler. For the next few months at least while the work is carried out I can’t continue to run these sessions from home. Too much dust, noise and too little space! So the last session at my home for a while will be Tuesday 19th March. But fear not… Sling Library Drop In sessions will continue – I already run a monthly session at the Barnes Children’s Centre (67b Lower Richmond Road, Mortlake, SW14) on a Friday at 9.30-10.45 – see full dates and details here. And as above there will be a new monthly session in Kingston going forward too! The timing feels right to move these sessions away from my home and into the Childrens Centres, alongside other support for new parents. Private consults will continue as normal, I can still come to clients homes and clients are still welcome to come to my home too – I will just ensure I arrange these at times when the builders aren’t making too much rackett (and/or mainly at weekends). And likewise I am still very open to organising bespoke workshops so if you have a small group, who are all interested in learning more get in touch and I can come to you! Carrying your baby is such a personal thing – people carry for different reasons and different carriers suit different people. Here is Juliet’s story…. “I knew I wanted to carry my baby when I first found out I was pregnant. It seemed like a common sense thing to do; aside from the fact that we’d be able to keep going to places we enjoyed that may not be accessible with a buggy, I knew that I would want to keep her close and how this would benefit both of us. In advance of Rosa’s arrival, we bought a stretchy wrap and an Amazonas Smart Carrier. I liked the idea of the stretchy, it seemed soft and snuggly, but Rosa’s dad, Tony, was all about the buckles! When she arrived, I found that I alternated between the two. Whilst I did like the closeness the stretchy wrap provided and used this when I was staying local, the Amazonas was definitely more practical when going out and about and for longer walks. Rosa put on weight quickly and at around 3 months, I packed the stretchy wrap away. We carried on using the Amazonas, but as Rosa grew and her head control improved, we realised the limitations of it. Tony in particular wanted a carrier that could do a front outward carry (as well as wanting a more neutral colour than the purple, green and cream swirls of the Amazonas!). We went along to Sheen Slings library session and chatted with Madeleine about our options. We ended up borrowing 2 different slings to try – a Lillebaby and an Ergo Omni 360. Whilst we liked both, the Ergo was the winner due to the ease of use. After just a few days of having it, we put in an order for our own brand new one using a gift voucher we’d been given. Immediately the Ergo became our go-to carrier. I have explored other options since getting it – I have a lovely woven wrap and a ring sling, but I don’t find either to be as easy, comfortable and supportive to use as the Ergo. Luckily, Rosa seems to love it too! We started with front inward carrying and when she was strong enough, started to use the front outward carry for periods too. As we got closer to her 1st birthday and she got heavier, we started to have a go with back carrying and recently, because I find it difficult to get her into a back carry by myself (need to practice more!) I have started doing a hip carry with it so she can see where she is going but can still snuggle in if she wants to. Tony and I both love carrying Rosa, I think keeping her so close has really helped us all to bond. Rosa seems to love being up at our level, seeing the world as we do and constantly interacting with us (and others who stop and talk to her, which happens a lot! ), which you just can’t do in the same way when they’re in the buggy. Tony was out shopping with her recently and she had a hold of some toothpaste. He went over to the counter, she passed it to the cashier and then passed over the card to pay as well! All that interaction will benefit her language and social communication skills no end! Recently, we’ve done trips to the zoo, farm, aquarium and we regularly go out walking in forests and parks. We only ever take the carrier on these trips and always feel a sense of freedom as a result. Rosa’s always found it easy to sleep in the carrier too and since I have learnt how to breastfeed in it, we can keep on the go whilst meeting all her needs. We’re dreading the day when Rosa outgrows the Ergo, but rest assured we will be back at the sling library to find a toddler carrier to add to our collection! There are far too many benefits to stop carrying any time soon! Our Connecta Stock is here!! I am so excited to announce the arrival of Connecta Baby Carriers for sale at Sheen Slings. They join our small but growing number of slings for purchase from consultations, workshops and sling library sessions.which also include Hana Baby Stretchy wraps, Boba Stretchy wraps, Close Parent Caboo Lite, and Izmi Baby Carriers. Connecta Baby Carriers have long been popular at the library, with many people hiring and a good deal going onto buy after that. Now we are able to offer a true ‘try before you buy’… hire one of our 5 library Connecta, then if you like it and choose to buy from us we will deduct the cost of the hire (the cost of one standard 2 week hire) and you simply swap our hire Connecta for a brand new one of your choice. Our stock includes both standard and petite strap Connecta in a choice of timeless Denim or a range of funky prints. We are adding workshops! In the fullness of time there will be a full range but for now we are getting started with “Introduction to Babywearing” and “Perfect Buckles”. These workshops last around 2 hours and really allow us to focus in on the topic, allowing you plenty of time to try for yourself in a cosy small group setting and come away really confident in which carrier or carriers will work for you and how to use them. Introduction to Babywearing is aimed at expectant and new parents with no or very little previous carrying experience. 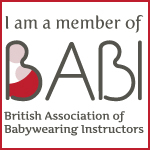 Perfect Buckles will best suit parents of 4-8 month olds who are looking to use a buckle carrier going forward, and will work equally well for those moving on from a newborn carrier (such as a stretchy wrap or caboo) and for those totally new to babywearing. For more on each of these workshops and details of dates, times and costs please head over to our Workshops page. Our daughter – Rachel Emma Boot – finally arrived earlier this month. Just in time for paternity leave to run nicely into Christmas for an extended family break together. Rachel fortunately loves a sling and seems only too happy to enable me try out all the library carriers with a smaller baby (many of which were only bought for the library after Tom was already too big to go in them). Looking to the New Year, my maternity leave will continue for the first few weeks of Janurary while I get used to being a mother of two! I will be taking bookings for private consultations again anytime from the 14th of January onwards. Then Sling Library meets will go back to the normal pattern of 10am-12pm last Saturday’s of the month and 2-4pm 1st and 3rd Tuesdays of the month starting from Saturday 28th January. There will be a couple of changes to these sessions. The first is that I will no longer be asking for deposits from those hiring slings. I have found taking deposits is a) quite inconvenient for parents and can be off putting, b) is quite a suprising amount of admin and faff for me and c) doesn’t actually seem to make a big difference when it comes to ensuring the safe and timely return of a carrier. I am very fortunate that the vast majority of library users really value the service and completely understand that not returning their sling on time means another parent doesn’t get to see it. So going forward I have decided to drop deposits and simply trust people. The second change is that I will be introducing a suggested donation of £2 for the sling library drop in sessions. This will be waived for anyone hiring a carrier. It is really important to me that people who might not want to hire a carrier feel really welcome to attend these sessions (i.e. people who already own a carrier they are struggling with, expectant parents who’d like to learn about carrier types in advance, and people who’d just like to try a couple of things on before buying and don’t feel like hiring a sling would be helpful to them). But equally I need to balance the fact that the hire fees are what pay for the slings in the library collection to be available both for those who wish to hire and for those who wish to simply learn. So the fairest way to do this and ensure the library can continue to grow is to simply ask everyone not hiring a carrier for a small donation toward the cost of these carriers. I have hesitated to introduce a suggested donation for a long time, because its really important to me that the sling library meets are accessible to absolutely everyone who’d like to come. And I really hope this doesn’t put anyone of. So for this reason I’d like to emphasise that this is very much a donation and not an enforced charge… there will simply be a jar. As many of you know, David and I are expecting our second child… due late November. The library will run as normal until mid-November (unless she puts in an unexpectedly early appearance), then the library sessions will be suspended for the rest of the year and will hopefully resume sometime mid-Jan once we’ve all had a chance to adjust to life as a family of 4. For more details on these sessions please check out the Sling Library Page.